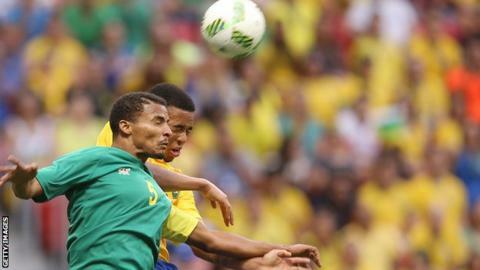 Celtic's move for Rivaldo Coetzee has fallen through after he failed a medical, his club have confirmed. The 20-year-old Ajax Cape Town defender was expected to join the Scottish Champions within the next few days. But his club said on their website: "Following a routine medical examination carried out by the Celtic medical department they discovered an underlying problem with his right foot. "The clubs were therefore unable to conclude the deal." Celtic boss Brendan Rodgers said after Saturday's 1-1 draw with St Johnstone that physio Tim Williamson had flown to South Africa to complete the medical. The Ajax Cape Town statement continued: "We can confirm that Rivaldo Coetzee will return to the club from Johannesburg where the player was undergoing a medical examination ahead of a proposed transfer to Scottish champions, Glasgow Celtic. "The player will return to Ajax Cape Town for further evaluation. "The injury has not hampered Coetzee to date, having not missed out on any competitive action either for his club or the national team. Ajax Cape Town can confirm that they were not aware of any condition that would have potentially hampered a transfer to Celtic. "While disappointed that the deal could not be completed at this point, the club are fully committed to giving the player the care and attention required in order to make a full recovery." The transfer window closes on 31 August and Rodgers revealed on Saturday he expects to have a "number of additions to the squad" before then, although he said there was no movement on the club's bid to bring Patrick Roberts back on loan from Manchester City. The Scottish Champions stretched their unbeaten domestic run to 53 games thanks to Callum McGregor's leveller against St Johnstone on Saturday. And after the match Rodgers called on the home support to show patience with his side as they try to stick to his passing philosophy. "I always ask the players to play, to have the courage and the nerve to do that, and if they make a mistake it is up to me," Rodgers said. "We had one example with Kieran (Tierney), under pressure with no-one near him, probably felt as a young player that he had to smash it forward and we end up giving the ball away. "I was signalling to stay calm. This is football. You have to stay calm when under pressure, not just the players but outside. "Or you can play Scottish football. Just smash it up the pitch. It hasn't got you anywhere for 20-odd years. "It is understandable that the supporters want to see the ball in the box. "But I've said since I came up here, the quicker it goes forward the quicker it comes back at you."